California Schemin' by Kate George, a Mysterious Review. 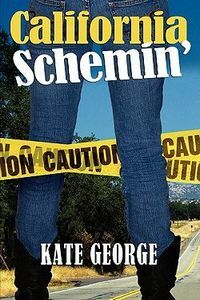 Review: Vermont reporter Bella Bree MacGowan travels to northern California to be with her boyfriend Beau and to recover following the events of the previous book in this series, only to be drawn into another murder investigation, in California Schemin', the second mystery in this series by Kate George. In the first few pages of this mystery, Bree witnesses a woman falling from a bridge into a river, tries to save her only to discover she had been shot in the head, drags the body onto shore only to be chased away by a bear, watches the presumed killer try to find her from the safety of a tree (to escape the bear, not the man), and later finds Beau's home ransacked, his truck broken in to and its tires slashed. And if that weren't enough, she thinks she's breaking up with him as he wants to live in California and she misses her home in Vermont. It's all well and good to hit the ground running in a mystery, but there is a disconnect here: far too much going on with far too little to make it interesting. Bree never seems concerned that she's in danger, acting as if finding dead bodies and being pursued by killers is an everyday matter, on par with shopping for groceries. And about as exciting. The underlying mystery plot, however, is entertaining, if not terribly credible, though the near constant activity on the part of Bree tends to mask its progress. Overall, California Schemin' makes for a fast read, but — depending on one's expectations with respect to character and storyline development — it may not be an altogether satisfying one. Acknowledgment: the author provided a copy of California Schemin' for this review.